Have you ever sat there, wondering how other people are awesome at customization and you aren't? Have you ever wondered what the secret is to a well-customized pet? Have you ever thought about what color socks Dragona thinks are tastiest? Well, I can't help you out with that last question, but I can certainly help you with the first two thoughts. 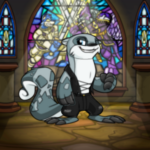 I've been customizing my pets since the beginning of customization, and I've learned a lot about what makes a pet look good and what makes a pet look like it crawled out of a sewer. You know, there's more to the art of customization than slapping random items on your pet and going "AWW, ISN'T HE CUTE?!? LOOK AT THE WITTLE JUBJUB! HE'S SO CUTE, I COULD JUST EAT HIM UP!" Both I and the JubJub agree; not only is eating a JubJub absolutely disgusting, but you should put some thought into your pet's outfits so he or she doesn't look like the aftermath of an Exploding Pizza Pasty when you're done. If you want to avoid such horrible sights, you should definitely read on. But wait, what is customization anyway? Is it a new flavor of Neocola? *Violence is not the answer. However, in order to make this Customization thing work, TNT had to redraw all the pets to share a common pose. That meant Faerie Xweetoks, which previously flew gracefully in the air, would no longer fly. Grey Kacheeks, which usually sat down and looked at the ground, were going to have to stand up. And Darigan Krawks, previously on the heavier side, would have to go on a diet in order to be as slim as the other Krawks. It's a shame too, because I personally liked the old, bigger Darigan Krawk. But there was good news. TNT knew how mad people would get if their precious pets were automatically converted to the new artwork, so, fearing another mob of angry teens with torches and advanced math textbooks, they gave some players an option to choose whether or not they wanted to convert their pet to the new style. The pets that were given an option were the ones that TNT felt had the most dramatic redraws, such as the previously mentioned Faerie Xweetok, Grey Kacheek, and Darigan Krawk. The more basic pet designs were automatically converted. Although many people did convert their pets, many others chose to keep the old looks. The pets that were not converted are, appropriately enough, called "unconverted pets"; UC for short. UC pets are considered by some players to look better, however, they CANNOT be customized, with the exception of backgrounds and trinkets. Once a pet is converted, it cannot be changed back to UC. A pet that was never UC before can never be UC. However, if you really want a UC pet, many players on the Neopian Pound boards are willing to give up their precious UC pets, but not without something in return. Chances are, you'll have to trade pets to get one, and people are rather picky these days. Good luck trading imalittleteapot421475 the Blue Usul for that UC Faerie Draik you've always wanted. As well as UC pets, any pet painted Baby, Invisible, Maraquan, and Mutant, as well as any fruit/vegetable Chia, can only wear backgrounds and trinkets. There are a few exceptions to this rule, however. Maraquan Myncies can wear clothing, as well as Invisible Bruces and Invisible Kaus. The reason Maraquan Myncies can wear clothing is because their bodies are very similar to a normal Mynci's body. According to Editorial Issue 396, most Invisible pets can't wear clothing due to the fact that with the way the customization system is currently set up, the insides of clothes can't be shown, so it would look awkward dressing up an Invisible pet. You know, as if floating pants aren't awkward enough. Putting clothing on your pets is very easy. All you have to do is buy an item, go to your inventory, click the item, put it in your closet, and you can go customize your pet with it! But one thing first-time customizers will notice very quickly is that not all items can go in your closet. Now, obviously, some items, like all of that omelette your pets refuse to eat, or that innocent little Snowbunny your pet is afraid of, are not meant to be worn. But what about items like Scarf, Sun Hat, and Denim Overalls? They're clothes, but they can't go in your closet. This is because TNT made lots of clothes before ever making customization, meaning about the only thing they were useful for at the time was completing a Fire Faerie quest. Since there's so many of these unwearable clothes, TNT was never able to make all of them wearable (although some, like Wellington Boots and Tiny Umbrella, have been made wearable since April 2007). The good news is that there's an easy way to tell if an item is wearable or not. You can tell whether or not an item is wearable by whether or not it has the word "wearable" under the item's image when you view it in your inventory. Alternatively, you can look at one of the many petpages out there that list all of the wearable clothes in existence. There are three different types of wearables you should know about; Neopoint clothes, Neocash clothes, and Paint Brush clothes. Neopoint clothes are, obviously, items that can be purchased with Neopoints. Many Neopoint wearables can be worn by every single pet species, but there are also a lot of clothes that can only be worn by one species. You can usually tell if an item is a single-species wearable if it has the name of the species in it. For example, Mynci Riding Hat can only be worn by Myncies, and Poogle Wizard Hat can only be worn by Poogles. Of course, there's a couple of exceptions. Purple Cybunny Pyjamas can be worn by all species, since the point of them is to make your pet look (roughly) like a Purple Cybunny. Neocash wearables, obviously, are items purchased from the NC Mall. Neocash can be obtained by buying it with real money via a credit card or by redeeming a Neocash card, sold in a store near you. Or quite possibly a store very far from you if you don't live in a country where Neocash cards are sold, especially those of you living in Antarctica. Sorry, penguins. 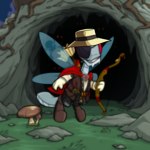 Alternatively, you could possibly win Neocash from Qasalan Expellibox or through special events (these include such events as Rosie's Springtime Celebration, the Daily Dare, and the more recent Neopia's Style Showdown). Everyone has a fairly good chance of winning at least some Neocash, and everyone receives a free Mystery Capsule when they make an account, so there's no excuse to not have at least one Neocash item. Almost all Neocash items can be worn by all species, so there's no worrying about whether or not your pet is able to wear the item. There's even an option to try out an item before you buy it. How convenient! It's important to note that some NC items are only sold for a limited amount of time or can only be won through a Mystery Capsule. You may be able to trade your NC items with other players for other NC items by using gift boxes (which are only obtained by redeeming a Neocash Card) if the item you want happens to be a retired item or from a Mystery Capsule, but remember to keep TNT's rules in mind! You can only trade a NC item for another NC item. No NC item for NP item trades! With the advent of customization, many people feared that the value of paint brushes would deflate. Contrary to most people's fears, however, the value actually went way up, as paint brushes now became a supplier of clothing. That's right, some paint brushes come with their own clothes! Colors like Pirate, Royal, Desert, Island, Robot, and a few others commonly come with their own unique clothing. 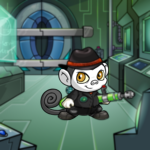 The best part about them is, once you paint your pet with these paint brushes, the clothes you get with them are yours to keep forever, and they can be worn by any pet of the same species! So, if you get a Royal Boy Grundo, and you have, say, an Orange Grundo on that same account, you can take the clothes off the Royal Boy Grundo and put them on your Orange Grundo. How cool is that? Just think of the possibilities! However, painting your pet is the only way to get them. Yes, Lab Ray zaps and Fountain Faerie Quests count too, and yes, a female pet can wear Royal Boy clothing and vice versa, to answer a couple of common questions. Now that we've gotten the boring introduction and bare basics of customization out of the way, now would be a good time to move on to the meat and potatoes of this article; Advanced Customization Theory! Now, the first step in customizing a pet is, of course, choosing a pet to customize. If it's your first time customizing a pet, you should probably know which species are easier to customize, and which ones you should probably avoid. Ultimately, it all comes down to what single-species wearables and PB wearables are available for that species. Some single-species wearables and PB wearables mix very well with each other. Some, when placed next to each other, look like a reenactment of the Meridell vs. Darigan war is taking place on your pet's body. Before you buy anything, do some research on that species's available clothing and try to imagine what the finished customization will look like. 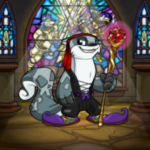 So what do customizers consider the easiest pets to customize? Arguably the two easiest pet species to customize are the Draik and the Hissi, due to the fact that they have a very wide selection of wearables that look good with each other, which allows for a lot of customization options. But since the Draik is a Restricted pet and the Hissi is a Limited Edition pet, they're not realistic options if you're brand new to Neopets or just started over from scratch. 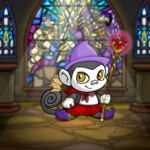 From my own personal experience, I've found that Myncies and Grundos are fairly easy to customize as well. Once again, a lot of their single-species wearables and PB wearables look good with each other. And, unlike Draiks and Hissies, Myncies and Grundos can be created for free at any time! Now the only thing you need to buy is some clothes. So then if Draiks, Hissies, Myncies, and Grundos are easy to customize, what's hard to customize? The two ball-shaped pets; JubJubs and Kikos. Their body types are extraordinarily hard to work with, since most clothes look rather awkward on them. That is, the few clothes they can wear, anyway. Their ball-shaped bodies don't agree with too many clothes, so the options become very limited as a result. If it's your first time customizing, DO NOT attempt to customize a JubJub or a Kiko. Even the pro customizers have difficulty making one look really good. The Chia, while it isn't anywhere as limited as the JubJub and the Kiko, has a rather poor selection of wearables as well, so they aren't recommended for customization newbies either. Other species you should stay away from until you get a feel for customization include the Flotsam, Koi, and Tuskaninny. Of course, I'm not saying you shouldn't ever try to customize these pets. They're just considered very difficult to work with. There are two big mistakes newbie customizers often make when they first start off. The first of these two mistakes is that they put random items on their pet with no real thought about whether the outfit looks good or not. Surely, you wouldn't walk into school wearing a potato sack, a purple feather boa, a blue hat, novelty glasses, and hiking boots. No, you wouldn't, wise-guy saying "Yes, I do!" in the back. Like I was saying, you wouldn't go to school wearing clothes that looked cluttered and ugly, so why should your pet have to suffer? And surely, you care about your pet's looks, right? Generally speaking, you probably want to stick to an average of about seven or eight items total, and yes, that includes the background. More may be used if they're smaller items that don't really cause much clutter. There's no need at all to fill up every single area of your pet. Sometimes, less is more. On the other hand, anything less than four items will probably look too bare. It's all about finding the right balance, but that's a judgement you'll have to make for yourself. Chances are, if your pet is wearing fifteen+ items, you need to remove some of those items before your pet suffocates in polyester and cotton. As you can see in the picture above, this customization is a bit bare. Sometimes, not having a lot of items works, but in this case, it would probably be a good idea to add more. However, this is overdoing it. There's no need to fill up every single area of your pet. This is roughly the amount of space the items on your pet should take up. 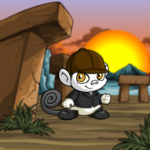 The customization isn't completely empty, but it doesn't look like the pet was trapped in a blender for five hours either. The second big mistake is, instead of tossing random items on their pet, they decide it's a good idea to have their pet wear the entire Daring Sea Captain Superpack. Now, don't get me wrong, it's a good-looking superpack. But, technically speaking, it's not your own creation. Sets and Superpacks (Sets refers to groups of NP wearables such as the previously mentioned Mynci Riding set, while Superpacks refer to the Superpacks sold in the NC Mall, if you need clarification on the difference between the two terms) are essentially just premade outfits. What you want to try to do is mix and match from different sets. For example, maybe instead of using both the Mynci Riding Hat and Mynci Riding Shirt, you can replace the hat with the Musical Mynci Hat. Just because an item has Riding in its name doesn't mean it can only be paired with other items with Riding in the name. Match items based on appearance, not name. This looks pretty good too, doesn't it? And notice how I mixed items from various sets. That's more creative. Color is sort of like the Zafara Double Agent. It can be your friend, or it can be your enemy. This, of course, all depends on how you use it. Too many colors can make your pet look very tacky, even though it's only wearing five items total. My advice to making a good color scheme is to pick one or two main colors to work with, for example, red and blue. Most of the items you use should be either one (or both) of your main colors. But you don't have to necessarily stick to just those colors. You might be able to sneak in another color as well, like maybe purple mixed in with the red and blue. But make sure to use your best judgement when you introduce a new color into your customization. You don't want the item to stick out like a sore thumb. When you take a look at your pet, if there seems to be one item that's much, much, much more noticeable than the rest, it's probably a good idea to get rid of it. Subtle hints of color create interest, but too much of that extra color can really tarnish a pet. Keep in mind that black and white can usually go with almost anything. Black and white clothes, such as Black Utility Trousers and White Top Chop Trousers, are great to have as an all-around item that can be used in many situations. It's also important to note that you also want to be careful about all of the different shades of colors. Let's go back to our color scheme of red, blue, and purple. Red, blue, and purple look good together, but if the red and blue items are dark shades of red and blue, and the little bits of purple are really light, the purple will probably stand out more than you want it to. In that case, you should try to find dark purple items to replace the light purple items. On the other hand, if everything is too dark or too light, your pet may get lost inside the customization. It would look like TNT just added a new Kacheek Seek location. There should be some contrast between the clothes and your pet so you and everyone else can find him or her. It's all about finding a proper balance. As you already saw before, this image is highly cluttered. Did you also notice the lack of any real color scheme? Not paying attention to color coordination can actually make a pet look more cluttered than it already is. This customization sticks mainly to red and purple for the actual clothing, and black and white for the pet itself. The black and white base color helps to distinguish the pet from the clothing, but is still visually appealing. Giving your pet a theme can add a lot of character to your creation. Is your pet an adventurer? A spy? A wizard? An athlete? A report-happy n00b that shoves another report form in TNT's face every five seconds? Matching colors together is great and all, but it's also great if you can add this extra depth to your customization. Needless to say, if your pet is supposed to be evil, don't make him or her wear My Sisters Frilly Skirt or Pretty Pink Flower Hat. Likewise, don't make an elegant princess wear an Ultra Fashionable Potato Sack (actually, don't make ANY pet wear one of those), don't make a wizard hold a Glowing Toy Sword, and don't do anything else that would be completely odd. For that matter, whenever you come up with a theme idea, it's a good idea to not make the theme so specific. Adventurer is a good theme. Undead Soldier is a good theme. A Clown From Kreludor That Loves Ice Cream So He Wears An Ice Cream Hat And He Has A Pet Origami Spyder And He Loves Rock And Roll So He Has A Guitar Oh And He's Really Poor So He Lives By The Rubbish Dump And His Favorite Color Is Pink is NOT a good theme. A good theme should be almost instantly recognizable by most people as soon as they see the pet. Nobody wants to have to read a long description to understand why your pet is wearing whatever it is they're wearing. 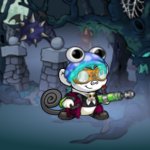 You don't get to see a description of the pet when you're voting in the Customization Spotlight either, so if your pet's theme happens to be A Clown From Kreludor That... the theme I mentioned before, don't expect many people to give it a high rating. 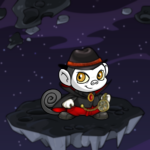 This pet is obviously supposed to be some sort of explorer. But what's this image supposed to be? I can't tell, can you? You should also avoid giving your pets obvious themes. By obvious themes, I mean a pet painted Desert with a Desert theme, a pet painted Pirate with a Pirate theme, etc. Again, the pet may look good, but it wouldn't be considered too original. I can't stress enough how important it is to mix and match. Possibly even trickier than avoiding clutter or bareness, matching colors together, and coming up with a good theme, is being original. There are a lot of customizers out there, and many people have probably come up with the same ideas you may have come up with. 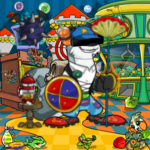 Look at the past Customization Spotlight Winners, and look at the pets of some of the players who frequent the Customization boards, and see what's been done before. Feel free to use someone else's customization as inspiration, but don't make your pet a carbon copy. Play around with different clothes and come up with your own ideas. Have fun with it. Try new things. That's what customization is about. The world can only take so many pets with a Christmas theme, especially when it's not even December. And of course, don't be afraid to ask for assistance. If you show that you've made a conscious effort to customize your pet, most people will be more than willing to help you make your pet look amazing. Well, I think I've drilled enough information into your head. By now you should have a pretty good idea of how to make a well-customized pet, as well as a throbbing headache. Now go out there and start customizing! ...Just as soon as your headache goes away. It helps to be able to think clearly when you're customizing.